Hip dislocation also damages the ligaments, labrum, muscles, and other soft tissues that hold the bone in place. This can include the nerves (sciatic) aswell. 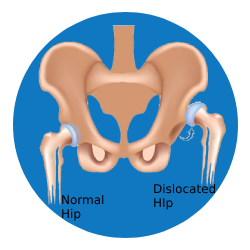 With hip dislocation, there are often other related injuries, such as fractures of the pelvis , thigh bone, knee. Posterior dislocation: It is the most common dislocation. In this type of dislocation, the thigh bone is pushed out of the socket in a backwards direction. Anterior dislocation: In this type of dislocation, the thigh bone is pushed out of the socket in a forwards direction. Open reduction when closed reduction fails and also when associated with fractures.